I use an air drying clay to sculpt: I have just begun sculpting and the cheapest and most readily available clay to me was found at a local craft supply store. It is great for a quick mold but I find that if I spend a lot of time trying to detail the facial structures it dries out and begins to crack. Even adding water as I work is only partly effective. Still, it's quite fun and I am really enjoying learning! Great start! Thanks for uploading and sharing. I like your strange little man. 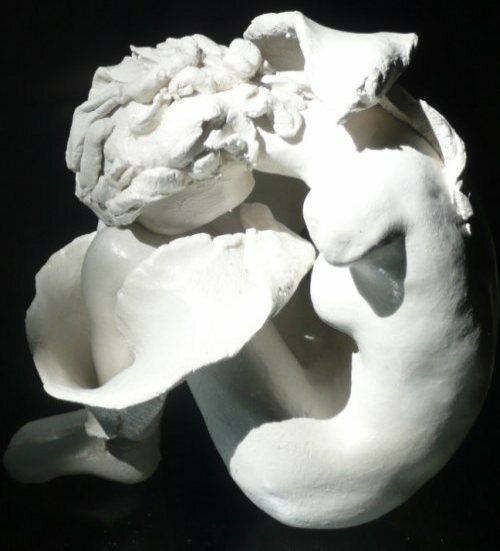 Sculpting is fun and I believe it's all round good for you too. Sometimes it gets frustrating, but I find you just have to work quietly and positively through those times - always living in the present moment (as Caesar Milan might say) and projecting a calm assertive energy. This is a good life lesson. You don't say what clay you are using - because some of our more experienced visitors might be able to help with the cracking thing. Be sure to read the other submissions in this section as these issues are dealt with and there are some excellent home-made recipes. We are lucky to have in our online community a very helpful resident expert - Sangeeta - who has passed on much of her knowledge right here. Good luck and happy sculpting! It feels so good to have someone else recognize my work, funny as that work may be at this early stage. Thank you! The clay is Amaco Air Dry Modeling Clay, Terra Cotta. Now that I am hollowing out the head in the back after sculpting it seems to be drying more evenly. Still, there are some cracks and of course my general knowledge of how to sculpt is greatly lacking! Any advice will be appreciated. Thanks again!! So excited to find some info about air dry clay. Like Anna I too have just started using it and am worried about its long term resilience. 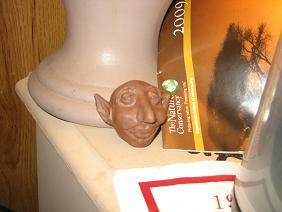 I have been doing small detail sculptures with this MAD clay I found in the local art/craft supplies shop. (Will attach a photo when I figure out how to). I have covered the sculptures with a Jo Sonja's (Chroma)Matte Varnish, which seems to protect it and gives a nice natural finish. But I'm just not sure how long it will protect it for. I was interested to hear that Shellac would be an alternative. I've been thinking about trying other clays and seeking out the use of a kiln at the local crafts council. I added your photos above - splendid work may I say! Yesterday my first batch of air drying clay arrived in the mail. I am a seasoned potter/sculpture with regular clay, but thought I would try this, mostly for kids that come to a one day class I hold at the local art center. What I want to know is does it really work as regular clay does, or are there any secrets I need to know about? Hi Marcy...I can't really help you as I haven't used ordinary clay. What I do know is that air dry is quite fragile once dry, altho my pieces are small and fine and kids will probably do chunkier pieces. It does give a lovely feel on the hands tho and my 8 year old daughter and her friend has had some fun with it. Good luck and hope you find more info. Oh and I think it could dry a little 'dusty' if you don't use a sealer or varnish of some sort over the top (see my comment above). i used pp towels rolls for the base and covered them with clay, then created cool tree logs [dead tree/fallen logs] which turned out well. however, it takes very long to dry and the pp towel [cardboard] roll absorbs much of the moisture. you can use tin foil to form your figure and then apply clay to that. should be more uniform. foil works well for cold porcelain too. to avoid clay cracks, you must let it cure. takes days. if you paint it before its dried, it will crack. Where can I find Sangeeta's advice on air-dry clay sculpting and which brand would she recommend? Is Sargent's better than Amaco? Thanks! Hi I am a school teacher I bought air dry clay and I was wondering if shellac will help keep the children's pieces longer? What kind? How many coats? Etc? Yes, use shellac, or any other type of sealant. There are proprietary ones easily available in craft stores, ebay and DIY/hardware stores etc. I used to varnish my kid's work with a watered down PVA glue, which worked splendidly to give a shine and a protective layer. The point is, try one or two little experiments before committing to putting on the kids works of art. In response to some of you who have had problems with your air dry pieces cracking, DO NOT use an armature! Someone said they noticed that when they used an armature they had cracking problems, but when they made a solid clay piece it did not crack. This is because air dry clay shrinks greatly when it dries, and if there is a rigid structure underneath, it will crack! 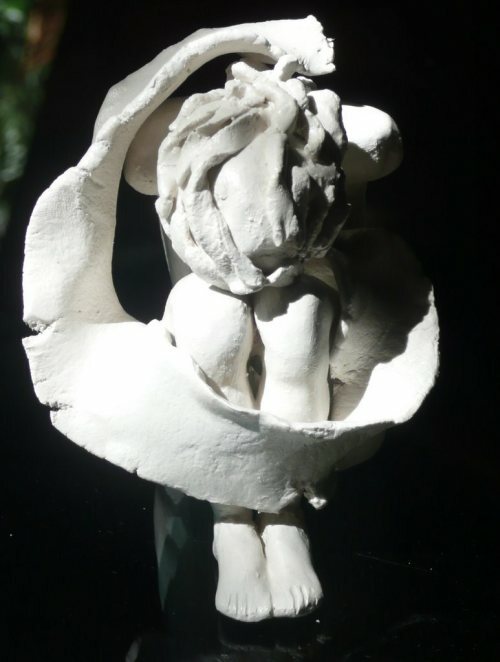 If you must use an armature under your air dry clay, try crumpled paper (NOT aluminum foil). This will give the clay room to shrink while it dries. Hope this helps! Am using crayola air dry clay. I live in New Mexico (which can be very dry). Not knowing anything...I started with coils for the body, then smootbed somewhat. I let it dry in a cupboard with a plastic bowl over it. Kept it workable for 3 days...dried slowly. Haven't seen any cracks yet. Propped up heads and inside bodies with waxed paper, then removed it on second day. I sculpt on those flexible plastic cutting mats. First off I haven't been using air dry clay long.... however I've been trying to solve the cracking problem... it seems the more water you use the more likely it is to crack... I made roses by hand for a cake sculpture I am working on... I didn't use any water to make them and they didn't crack... also if you are or are not going to be using water make your sculpture under parchment paper... not wax... parchment you can get it at a grocery store by the plastic wrap... as the clay dries it shrinks... the more water the more it shrinks... the parchment paper allows the item to move without cracking as it shrinks slightly... I usu ally make the basic part of it the first day... then the next day if there are cracks I fill them in with more clay and then I use a very fine nylon acrylic brush and some water to make it perfectly smooth... keep the brush wet or it will make streaks... I hope this has helped... also at the end I use a spray on glaze sealer for materials with pores... I don't know how long it will last but I imagine it lasting cause no one has disturbed it.. you can find them on geetas henna & body art on facebook... also I intend to upload the cake when it's finished... I sculpted hands to make henna on.. and one haven't been sealed yet because I have to touch it up... my baby got a hold of it and made some hennames fall off lol. Our volunteer group created approximately 30 craft pieces using Creative Paperclay for a festival. We painted the items with acrylic paint and then sealed them using acrylic sealer (6 coats each.) The items sat outside for a month and the paint faded badly on all items. Would it help to seal the items with Gesso or Kilz before painting or is a heavier type sealer or varnish needed if the items need to sit outside on display for a month? We put a lot of work into the artwork and need to preserve it. Use a good acrylic house paint. Benjamin moore will mix whatever color you need. They are fade resistant.